While the U.S.S. Enterprise investigates the inhospitable, volcanic world called Excalbia, a mysterious event occurs. A man who claims to be slain U.S. President Abraham Lincoln (Lee Bergere) contacts the ship and asks to come aboard. He shows all the mannerism of the real Lincoln. Although Captain Kirk (William Shatner) is certain that this unusual being could not actually be Lincoln, he nonetheless beams him aboard, and with full presidential honors, to boot. This act angers Mr. Scott (James Doohan) and Dr. McCoy (De Forest Kelley), who both fear that the alien boasts malicious intent. President Lincoln invites Kirk and Spock (Leonard Nimoy) to beam down to the surface of Excalbia, even as a pocket of breathable atmosphere and hospitable land appears there. 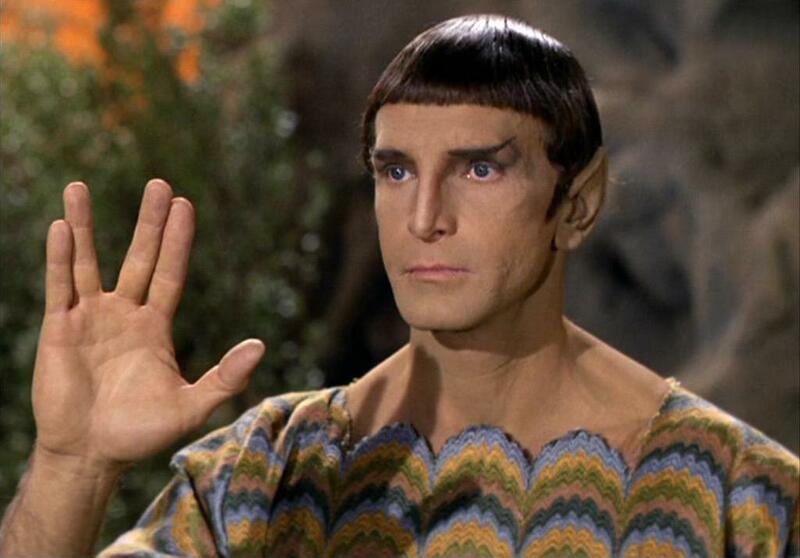 Lincoln also assures Spock that he will meet the greatest Vulcan in history, below. Kirk and Spock beam down, and are confronted with a silicon life-form, an Excalbian named Yarnek (Janos Prohaska). The Excalbians, Yarnek reveals, do not understand the human concept of good and evil, and have enlisted Spock and Kirk to help them comprehend it better. To this end, they have teamed the Starfleet officers up with Lincoln, and Surak (Barry Atwater), the Vulcan philosopher who led Spock’s planet to peace through logic. Opposing these “good” beings is a team of great evil. These individuals include 21st century warlord, Colonel Green (Phillip Pine), the Klingon unifier, Kahless (Robert Herron), Genghis Khan (Nathan Yung) and the fiendish and sadistic Zora (Carol Daniels De Ment). When Kirk refuses to participate in this staged contest, the Excalbians raise the stakes. They threaten to destroy the Enterprise unless Captain Kirk and Mr. Spock participate in their “drama. In that story, Kirk must fight an alien starship captain, under the watchful eye of an advanced alien, a Metron, who has arranged the combat. In choosing not to kill, Kirk demonstrates his -- and humanity’s -- value system, and proves that the species has outgrown its infancy. 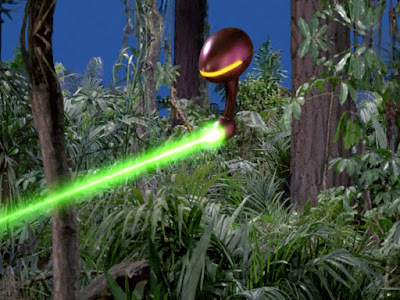 In “The Savage Curtain,” Kirk and Spock must fight a team of villains, under the watchful eye of another advanced alien, the Excalbian Yarnek, who has arranged the combat to “learn” about human concepts of good and evil. Again, Kirk demonstrates humanity’s value system. One more fighting, and choosing not to kill, is the crucible by which a specie’s development is judged. Yet some qualities clearly differentiate the two episodes. The Metron in “Arena” is haughty and arrogant, gazing at man as a primitive species. By contrast, Yarnek possesses a certain brand of innocence or naivete in his fumbling quest for knowledge. Although he goes about learning in absolutely the wrong way, Yarnek’s ultimate goal is indeed information; knowledge which he will share with his people. 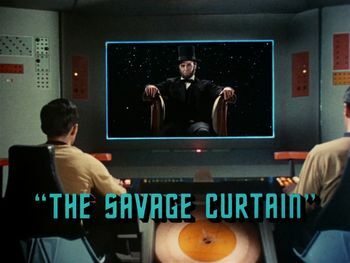 Similarly, the “The Savage Curtain” contends, at least subtly, with the meaning and nature of hero worship. 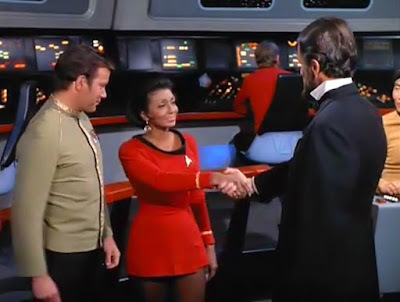 Captain Kirk meets one of his heroes, Abraham Lincoln, and Spock encounters one of his: Surak. The question, appropriately raised by Scotty and McCoy, is…can hero worship lead one to folly? In this case, Kirk is willing to “follow” Lincoln to a planet surface that could instantly kill him. Kirk and Spock both admit, as well, to being beguiled, after a fashion, by Lincoln’s charm and wit. 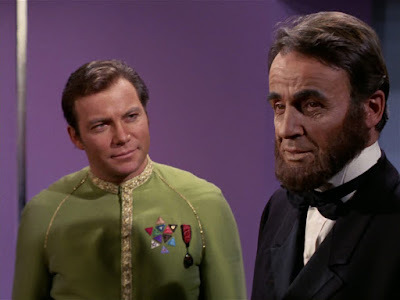 Although Lincoln and Surak are defined in the episode as “good,” the episode also suggests what can happen when people follow even good leaders into danger because of loyalty, belief, or faith. Kirk and Spock’s eyes are always open, however, and one true virtue of the episode is the way that Kirk gazes at Lincoln not just as a hero, but -- at the same time -- as an alien being making (hopefully peaceful) first contact. There’s great complexity in Kirk’s character on Star Trek, and this episode explores that complexity. He both honors and respects the historical Lincoln (and his avatar aboard ship), and simultaneously maintains a “distance” from that hero worship, considering the reality of the situation; the fact that Lincoln is an alien. How he bridges this paradox is pure “Kirk,” and his approach confuses the hell out of Scotty and McCoy. “The Savage Curtain” is remembered by Star Trek fans, today, for its depiction not only of noble Surak, who developed and implemented the Vulcan ideal of logic, but for its introduction of Kahless, a Klingon leader who unified his empire. 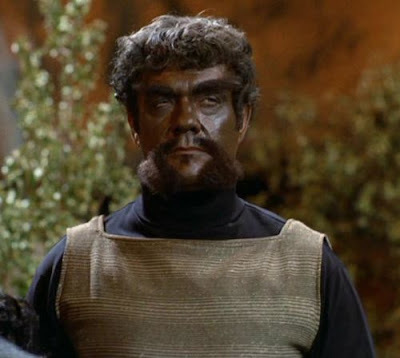 What seems a bit disappointing, at least today, is that Kahless and Genghis Khan are both viewed in two-dimensional terms, as “evil.” Clearly, Zora, who sadistically experiments on other lifeforms and the deceitful Green qualify as evil by most fair standards, but Genghis Khan? Kahless? Are they truly evil? Or products of their time, and cultures? Perhaps this is doubly disappointing, because “The Savage Curtain” reveals some genuine thematic complexity in Kirk’s final speech to the Excalbians. Yarnek professes confusion/disappointment that both good and evil forces resort to physical conflict. Because of this fact, he can’t discern which philosophy is which. He sees no operational difference. Kirk sets Yarnek straight by noting that while the “evil” team fought for its own selfish reasons (survival and dominance), the “good team” fought to save the Enterprise and her crew. Kirk warred not for power or glory, or because he wanted to win. He fought because innocent lives were at stake. From Kirk’s speech, a crucial point is made. Good and evil are the same in terms of fighting, but different in terms of their goals. The sad thing, however, is that Kahless is not allowed to be viewed this way by the episode. He unified his people, and by that perspective would surely count as a great, unselfish good. One facet of this episode that is not often discussed is the role of Mr. Scott. Whatever the third season’s alleged detriments, it is fair to state that Scotty, during this span, evolves to become a more well-developed and prominent character. In “The Savage Curtain,” he is right there, beside McCoy, offering vital counsel to Kirk, and showing a bit of rebellious spirit too. In another episode, “Turnabout Intruder,” Scotty takes charge in a difficult situation, and organizes a mutiny against a Captain Kirk impostor. Throw in the (inferior) Scotty love story, “The Lights of Zetar,” and some excellent character moments in “The Enterprise Incident” and “Is There in Truth No Beauty,” and one can easily imagine a fourth season of Star Trek in which Doohan’s named followed De Forest Kelley’s in the opening credits. One can see, in the third season, Scotty ascending to join the Big Three. Finally, there is a lovely scene in "The Savage Curtain" that re-iterates Star Trek's commitment to diversity and equality in the galaxy. Abraham Lincoln calls Uhura a "negress," and then apologizes for his selection of words. Uhura responds, sincerely and elegantly, that she lives in a world in which words such as that no longer carry the ability to scar. Kirk adds that everyone in the 23rd century has moved past prejudice to experience "delight" in who they are, and what cultures and ethnicity they represent. This was a powerful and affirming philosophy in 1969, and is so today, in 2017. 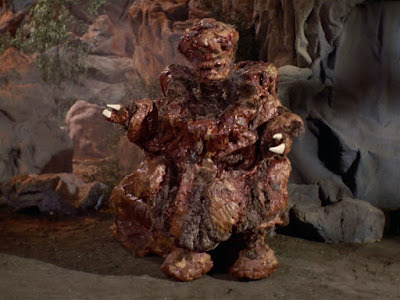 “The Savage Curtain does not leap to mind as a great or particularly innovative episode of Star Trek, but nor is it counted among the worst in the series. It’s a solid installment, and one that has influenced ensuing generations through the introduction of characters like Surak and Kahless. If and when I revisit this series I will keep your episode reviews at hand, John. Yarnek is a fantastically designed and realized being. This series was a major influence in me wanting to get into the biz. One visual knock-out after another. Here's another vote for Yarnek as one of the best aspects of this memorable episode. So many shows of this era, not only Star Trek but The Outer Limits and Lost In Space, offered weird, completely alien and non-human beings that were wonderfully realized. Even Space:1999 gave us the monstrous creature from "Dragon's Domain." I find that today's science fiction series are more human-based and offer(dare I say it) less imaginative designs for extraterrestrials. How many of us stuck a french fry or a spork to our foreheads and told our nerdy friends, "Look! I'm a Star Trek alien!" Admit it - you've done it, too. Also notable is the suggestion that Lincoln, Surak and probably the other historical figures are all Excalbians, transformed into humanoids for this experiment. Even so, their fates on the battlefield are sympathetic and "The Savage Curtain" stays with you, long after the curtain has dropped. Spot on. Lee Bergere is superb as Lincoln, and the interaction with Kirk is actually rather moving. The scene with Uhura might be a tad forced and maudlin, but not bad overall. Better than it gets credit for.